WearCheck was once again present at Mining Indaba 2017 recently, where many people came to the stand to chat about condition monitoring. This year, WearCheck shared a stand with sister company Set Point Laboratories (SPL), which is also part of holding company Torre Analytical Services. How does oil work? Part two. Three parameters need to be considered when looking at the various lubrication regimes. They are: the load placed on the surfaces, the speed at which they are moving relative to each other, and the viscosity of the lubricant. Viscosity is a very important property of a lubricant and will be defined at this point as a fluid's resistance to flow at a particular temperature. Fluids that have high viscosities do not flow easily (such as molasses) - high viscosity oils are sometimes referred to as 'thick' oils. Fluids with low viscosities flow easily (such as water) - low viscosity oils are sometimes referred to as 'thin' oils. It is important to remember that when an oil is heated up, its viscosity will decrease. In other words, it will 'thin out'. Likewise the viscosity will increase as the temperature decreases and the oil will 'thicken up'. Because of this an oil's viscosity must always be accompanied by the temperature at which the measurement was made for it to mean anything. In a situation for ideal lubrication the viscosity and the speed should be high and the load low. If this were always the case then lubricated surfaces would always be separated and only fluid friction would come into play. Unfortunately we do not live in an ideal world and this is not always possible. In the case of a plain bearing and a journal there will be a small amount of lubricant between the mating surfaces. However, because of the load and zero speed on start-up, the lubricant film will not completely separate the bearing from the journal. In this situation the asperities will break through the lubricant film and make contact; this is known as boundary lubrication. All is not lost, however, and the situation is far better than if no oil were present at all. Typically, the coefficient of friction of unlubricated metal surfaces ranges between 1.5 and 0.5. With boundary lubrication it is between 0.1 and 0.02. Boundary lubrication can be subdivided into: oily lubrication, antiwear lubrication and EP (extreme pressure) lubrication. Physical adsorption, whereby oil molecules and compounds blended into the oil are attracted electrostatically to metal surfaces and form bimolecular layers due to the polar nature of these compounds. A chemical reaction also takes place causing certain compounds in the oil to attach themselves chemically to the metal surfaces. This allows very thin films, usually only one or two molecules thick, to form and help reduce friction whilst not totally separating the metal surfaces (see Diagram 3). 2. Antiwear lubrication occurs because of the presence of chemical compounds in the oil that are specifically designed to react with metal surfaces and form a protective layer. The melting point of these compounds is fairly low and is below the temperature at which EP compounds are effective. Antiwear additives are sometimes referred to as mild EP additives. 3. EP lubrication is required where high pressures and hence high temperatures are encountered. This is achieved by the addition of compounds that contain phosphor which has a high melting point and low shear strength. In other words, they they make the metal surfaces slippery. The coefficient of friction in a plain bearing is related to the load on the bearing, the speed at which it is turning and the viscosity of the oil that is lubricating the system. Assuming the viscosity remains constant throughout (as will the load) then the coefficient of friction will vary with the change in speed. On start-up the speed is low (zero) so that the coefficient of friction will be high but will decrease as the speed increases. The graph below illustrates the relationship where initially the solid friction is very high but is gradually replaced with fluid friction as the journal begins to turn. In theory the journal should be located coaxially with the bearing. However, in practice, this does not happen unless the load is extremely small or the shaft is mounted vertically. In practical cases there is an appreciable load on the oil film and the journal cannot rotate coaxially to the bearing. As speed increases a wedge is formed between the converging surfaces through which the oil is forced as it is entrained by the rotating shaft. At this point the fluid has a greater velocity, and hydrodynamic ressure is created which counterbalances the load and keeps the mating surfaces apart. Under this type of lubrication regime the coefficient of friction is reduced to the order of 0.005. It will be noted from the graph that the minimum friction is achieved just before the onset of hydrodynamic lubrication. It is at this point that solid or static friction is replaced by fluid or kinematic friction. Unlike solid friction, fluid friction is dependant on speed and gradually increases as the speed increases. The surfaces in relative motion that require lubrication that have been considered so far have had the same geometry, that is they fit together like two spoons. In the case of a ball or roller bearing, the contact area between the mating surfaces is vanishingly small. With a ball bearing in a race, the area of contact is a tangential point and, with a roller bearing, a tangential line. Remember that pressure is defined as force over area and this situation the area is very small. With normal loads in roller elements, pressures of 1.5 Gpa (1,5 million kilopascals) can be reached. Under these conditions both the roller elements and the oil behave in a non-Newtonian fashion (see Newtonian fluids section on back page). These high pressures are known as Hertzian pressures and the point or line of contact of the roller is known as the Hertzian region. These high pressures cause both the roller and the race to elastically deform to a small degree which spreads the pressure over a small but finite area. Oil is drawn into the Hertzian region by hydrodynamic forces and when subjected to these Hertzian ressures the viscosity increases (reversibly) dramatically and has the consistency of window putty. It is this increase in viscosity that enables the oil to lubricate under these extreme conditions and this lubrication regime is known as elastohydrodynamic lubrication. How does oil work? Part One. Friction is a ubiquitous part of our daily lives. Walking, writing, opening doors and drawers and driving to work all involve energy being expended in order to overcome friction. Although friction is generally thought of as a negative mechanical characteristic (approximately 20% of a car's energy is spent in overcoming friction) it must be remembered that without it we would not be able to walk and the brakes on our cars would not work. Friction is usually seen as a mechanical problem and the force necessary to overcome it has long interested engineers. When man invented the wheel it enabled him to move weights around with far less expenditure of energy than if they were dragged from A to B. What he had in fact done was to replace sliding friction with rolling friction which has a much lower value. This blog looks at the role of oil in reducing the harmful forces of friction. An understanding of friction will be helpful as a starting point. Friction can be defined as the resistance encountered when one body moves relative to another body with which it is in contact. The first law states that the force of friction that exists between two surfaces is directly proportional to the perpendicular pressure between them. In order to slide a metal cube of mass M across a table, a tangential force, F, must be applied. If M is doubled then F must also be doubled to get M to move. The second law states that the force of friction is independent of the surface area of M in contact with the surface over which it is being made to slide. If M were to have an oblong cross section, it would not matter whether the larger or smaller surface area was placed on the table; the force of friction, or the force required to move both blocks, would remain the same. Diagram 1 illustrates this point. The third law says that the force of friction is dependent on the nature and state of the surfaces. Smooth surfaces generate less friction than rough surfaces. The first law can be restated as the ratio between F and M for a particular system is constant and F/M is known as the coefficient of friction. This coefficient can be easily measured by using gravity to make a metal block slide across a surface. Although the mass can be weighed and the force to get it to move easily determined, inertia causes problems. Newton's first law of motion can be interpreted as saying that bodies at rest tend to stay that way unless acted upon. This means that the initial energy required to get the metal block to start moving (overcome static friction) is higher than the energy required to keep it moving (overcome dynamic riction). Once the initial energy has been expended to overcome the static friction, the coefficient of friction settles down to a constant value equal to the dynamic friction. Thus frictional drag is lower once a body is in motion. Surfaces that appear smooth and shiny to the naked eye will show peaks and furrows when examined with a microscope or even a magnifying glass. This does not mean that the component has been poorly machined but that components manufactured to prescribed tolerances may still have fairly rough surfaces at microscopic level (see Diagram 2). When two surfaces are brought into contact, it is the tips of the peaks that actually touch, meaning that large areas of the surfaces never come into contact. For example, the contact area of two flat steel surfaces subjected to a pressure of 0.5 kgcm-2 is about 1/40 000th of the apparent surface area. The size of the contact area not only depends on the surface area and roughness but also on the load acting on the two surfaces. The peaks where contact actually takes place are called asperities. Because it is the asperities that touch and because they make up a very small surface area, very high pressures and temperatures are achieved which can cause metal deformation and cold welding to take place. When the surfaces slide over each other, microscopic welds are produced between peaks which, due to the relative motion, are then torn apart. The laws of friction apply to one clean metal surface sliding over another. The laws break down when thin metal films or oxidised surfaces are considered. They also do not apply to very hard surfaces (eg. a diamond) or very elastic surfaces (eg. rubber) where the contact area no longer depends on pressure. Whenever friction is overcome, the dislocation of surface material generates heat and this frictional heat can be highly destructive to metal surfaces and cause wear to take place. Additionally, when there is solid friction (as opposed to fluid friction) wear will also take place. Material is lost due to the cutting action of opposing asperities and to the shearing of microscopic welds. In extreme cases the combination of high frictional temperatures, welding and shearing can cause complete seizure of moving parts. The harmful effects of friction cannot be overemphasised. The job of the engineer and particularly the lubrication engineer is to control friction: to increase it where it is needed and to decrease it where it will cause damage. Lubrication reduces friction by replacing solid friction with fluid friction. When one body slides over another, the force of resistance encountered at the points of contact is known as sliding friction. If a ball or cylinder were to roll over a metal surface, the relative velocity of the points of contact are actually zero and this results in rolling friction. It should, however, be noted that rolling friction is always accompanied by some sliding friction. Two main types of rolling friction exist. The first is where large tangential forces are experienced as in the case of a car wheel in contact with the road which generates considerable sliding forces. The second is where minimal tangential forces are present as is the case with a ball or roller bearing. This is sometimes known as free rolling. Studies show that elastic deformation of the roller and the surface occurs and this gives rise to the resistance to motion (friction) that is encountered. The energy returned to the system when the deformation returns to normal is less than the energy required to cause the deformation. This excess energy is lost as frictional heat. Tests show that rolling friction is not influenced by the presence or absence of a lubricant. However, lubrication is still important in this situation because the elastic deformation of the surfaces introduces sliding friction which can be reduced by the introduction of a lubricant to convert solid friction into fluid friction. The friction that exists between two bodies in relative motion involves an appreciable energy loss which needs to be minimised. This is achieved by feeding lubricants between these sliding surfaces which replace solid friction with fluid friction which can be far smaller. A lubricant must possess two basic properties: some degree of fluidity to spread over the surfaces and adhesive power to allow the fluid to remain in place during motion. Oils are particularly well suited to this job. When an oil is fed in between two moving surfaces it causes them to separate and in doing so eliminates the solid friction that exists between them. Unfortunately viscous drag (fluid friction) exists in the oil so that friction can never be totally eliminated but it can be greatly reduced. The oil can cause the surfaces to separate in a number of ways and, when this is not completely possible, friction is still kept to a manageable level. The lubrication regimes that will be considered here are: boundary lubrication, mixed film lubrication and hydrodynamic lubrication which includes elastohydrodynamic lubrication (EHD). More to follow in part two, alternatively click here to download the pdf. At WearCheck a hard-working team of voluntary internal auditors operates behind the scenes to ensure that our systems and processes continue to run smoothly. These dedicated workers are recognised for their contribution to the company, over and above their normal duties. The recipients of the 20115 Internal Auditors of the Year were Salisha Dhanasar (supervisor of the Middelburg laboratory) and Lyn Gengan (customer services) in Pinetown. Above: Lyn Gengan received the 2015 Internal Auditor award for Pinetown. 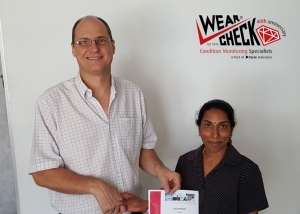 Below: Salisha Dhanasar was awarded the 2015 Internal Auditor award for Middelburg. WearCheck’s Cape Town office, which moved to new premises several months ago, has recently welcomed new customers and continues to serve organisations from the maritime, road transport, aircraft and electrical, construction and earthmoving sectors. Now situated on the corner of Viking & Odin Drive, Thor Gardens, Thornton in Cape Town (Opposite the Epping Market), WearCheck Cape Town is highly accessible from the port as well as the surrounding industrial areas. Cape Town branch co-ordinator Quintin Ras, who recently relocated to the Western Cape, has five years’ experience in oil, fuel and transformer oil analysis, including supervising WearCheck’s Steelpoort branch since 2011. WearCheck Cape Town offers on-site sampling option in addition to the full spectrum of WearCheck oil analysis and reliability solutions services. Greases, fuels, coolants, filters and transformer oils are also analysed, plus the provision of many alternative monitoring options, such as vibration, thermography, balancing and alignment, create a one-stop condition monitoring service. A number of major marine companies are serviced by WearCheck Cape Town, among them Safmarine, Irvin & Johnson, Portnet Marine Services, Sea Harvest, Unicorn Shipping, FFS Bunkers, Atlantic Fishing Enterprises, Smit Marine SA, Lusitania Trawling Service, Viking Fishing Company and De Beers Marine floating mine. Customers from other industries include the Koeberg Nuclear Power station, the Western Cape Department of Transport and several municipal and provincial organisations. Photo above:The WearCheck Cape Town team is on hand to welcome you to their offices opposite the Epping market. They are, from right to left, branch co-ordinator Quintin Ras, newly-appointed customer support assistant Jandelee De Beer and driver Hoosain Sydow. Each year, the International WearCheck Group (IWCG) members meet in a different member country to share ideas on the newest technology and condition monitoring advances, to meet with international suppliers, brainstorm and to keep the thriving business network going. This year, the group assembled in Pamplona, Spain in July. 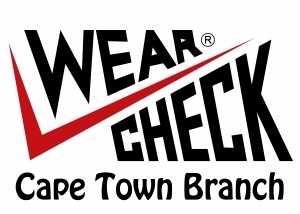 WearCheck and our Set Point Group sister companies, have been acquired by Torre Industries, a dynamic JSE-listed industrial entity underpinned by strong brands and strong products. The integration will have no negative impact on WearCheck customers, and the company will continue with normal operations, as will the other Set Point Group companies – Set Point Laboratories, Meter Systems, Letaba Group, Amis, Pneumax and RENG. Says WearCheck managing director, Neil Robinson, ‘We are pleased to be part of Torre – a solid, well-renowned group in the industry, and one which shares WearCheck’s high standards of customer satisfaction, continued investment in technology, and ongoing staff training and education. 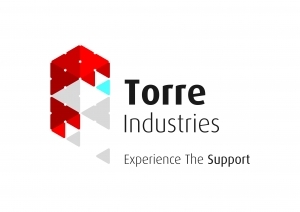 Torre is an integral business in sectors such as mining, automotive, construction and industrial. The company has shown steady growth since its listing on the JSE in 2012. Serving customers in selected high growth markets with the provision of equipment, parts, financing and support, Torre’s focus is the value added sale and rental of branded capital equipment, the distribution of high quality parts and components, the delivery of critical support services and the provision of financing solutions in support of their customers’ expansion programmes. Torre’s business units include Parts and Components which has vast product and brand solutions for the automotive, commercial, off-highway and industrial sectors, as well as aftermarket repair parts and components for earthmoving equipment in the mining and construction sectors. As the lifeblood of any mechanical system, oil performs many functions, such as reduction of wear, removal of contaminants, removal of heat and acting as a structural material. Technical Bulletin 60 explored the various laboratory techniques for detecting abnormal wear and contaminants in gas engine oils. In this edition, we examine what can be measured by oil analysis in terms of detecting oil degradation – both physical and chemical. Gas engine oils must withstand various levels of oil degradation caused by the gas fuel combustion process, particularly where fuel quality varies significantly over time, such as gas engines running on biogas. Condition monitoring techniques can facilitate effective maintenance of gas engines and support this emerging form of power generation. We discuss the most widely used and OEM-requested laboratory techniques for detecting oil degradation, including kinematic viscosity, viscosity index, FTIR (fourier transform infrared), oxidation, nitration, total acid number (TAN), total base number (TBN), RULER (remaining useful life evaluation routine) and the new test, IPH (initial pH). Interested in learning more? Then read Technical Bulletin 61 by clicking here. Did you know that there are serious consequences of poor laser shaft alignment? Or that WearCheck is about to open its 11th laboratory in the DRC? And, are you aware how the latest laboratory technology can help your business? All this information - and plenty more - is featured in the latest WearCheck Monitor newsletter. You can learn about GC, ICP and HPLC technologies, and why WearCheck has invested heavily in them. 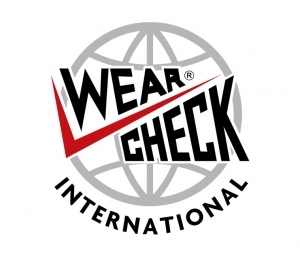 There is a wealth of information on WearCheck’s comprehensive training schedule and some useful take-home advice garnered from the WearCheck stands at several recent industry expos. Maintaining turbines in optimum operating condition at minimum cost is one of the goals of a good condition monitoring programme. WearCheck has created an oil analysis regime that does just this. Not only do the turbines themselves form a substantial financial investment for industry, but so does the oil that keeps the turbine components operating smoothly. The value of oil analysis in protecting these large capital outlays has been proven many times over. A variety of turbine oil sample tests yields a wealth of information which enables the best remedial action to be taken. Technical Bulletin 59 discusses the turbine sample tests in detail – how they are conducted and what stories they tell. To read the latest issue of Technical Bulletin, please click here.